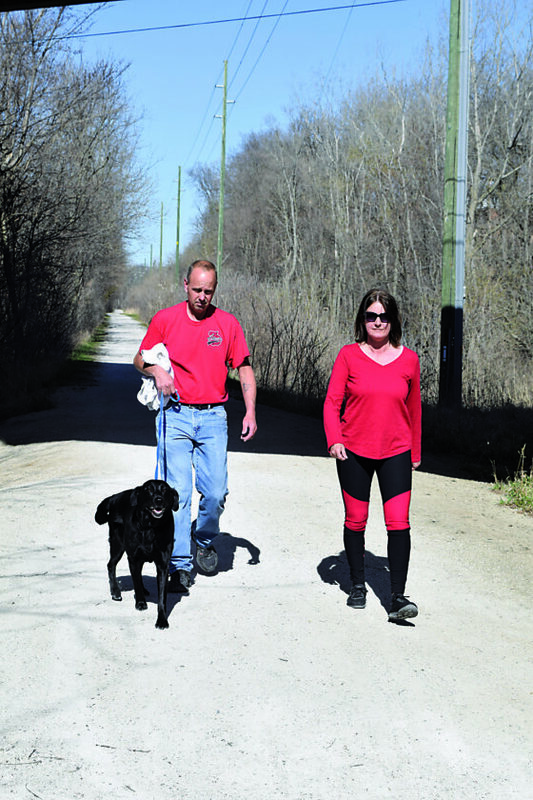 -Messenger photo by Peter Kaspari Troy Porter, left, and his wife, Tammy Porter, walk along the Snell-Crawford Trail with their dog, Bella. This past week the Fort Dodge City Council and the Webster County Board of Supervisors voted to support the “Hike and Bike Webster County” trail system plan. This plan was a collaborative effort between the city of Fort Dodge, Webster County Conservation, the Trails Advisory Board, and input from Fort Dodge and Webster County citizens. The purpose of this initiative is to provide a comprehensive plan for ongoing trails expansion for the next twenty years. Progressive communities across America have learned that quality, well-maintained trails can promote recreation, health and community vitality, which ultimately contributes to the quality of life within their communities. Quality biking/walking trail systems offer people of all ages increased physical activity, improved health and the enjoyment of the great outdoors. For youth, seniors, families and citizens of all ages, a quality trail system provides a very inexpensive and enjoyable amenity for recreation and physical activity. Trails are valued because they connect people with places and provide safe and enjoyable access to nature areas, parks and other outdoor amenities. The most effective trails are those that are paved and well maintained. When trails connect parks, recreational facilities, scenic nature areas, historical sites, schools, neighborhoods, etc., they can improve the overall character of a community. Trails also offer a number of economic benefits for communities. Trail systems attract visitors that enjoy biking and hiking to the area. They also enhance the desirability of a community which helps attract businesses and supports companies in recruiting and retaining employees, in particular, young families that want to live in a place that offers recreational and quality of life amenities. Studies consistently find that bicycle-friendly and walkable communities often see higher property values, increased tourism and greater economic activity. With this in mind, the Trails Advisory Board was established in 2006. Originally called the Trails Task Force, this committee has been and continues to be comprised of local citizens and city and county staff who are empowered to help lead planning and fundraising efforts to develop high quality biking and hiking trails in Fort Dodge and Webster County. Our first project was a challenging one — to build a paved trail from Fort Dodge out to Harlan Rogers Park, and then on to Kennedy Park. This project began in 2009, and was completed in 2011. Since that time, over 15 miles of paved trails and trail connections have been developed. Today, the city of Fort Dodge, Webster County and the Trails Advisory Board are working in partnership to expand our trail system. Together, we have developed a Phase II Plan that increases access to our current trail system and completes the loop around our city. This plan will extend the current trail network from the Humane Society to 15th Avenue South and then over to Oleson Park. To complete the loop, the trail will continue from Oleson Park to the Sunkissed Meadow Riverfront Trail. Once completed, our trail system will encircle the city of Fort Dodge. This Phase II project will add more than four miles of newly constructed trails, consisting of five individual projects and two new trail connections — providing users with direct trail access to seven city and county parks, three schools, numerous neighborhoods and the Des Moines River. This impressive trail loop will be approximately 22 miles long, mostly on new 10-foot- wide paved trails. In addition, planning continues for adding a one mile trail extension south of Fort Dodge, along the Des Moines River. The Phase II plan is a $2.1 million dollar project that will be funded by a combination of local, state and federal grants backed up with private donations from local citizens and businesses. The Trails Advisory Board is currently in the process of raising additional private funds in support of the Phase II plan. Our goal is $300,000. Once Phase II is completed, Fort Dodge and Webster County can boast about having one of the best trail systems in Iowa for cities our size and even larger. The Prairie Rivers Trail System has truly been a very successful public — private partnership, involving the city, the county, the Trails Advisory Board and also private citizens and businesses. It couldn’t have happened without a shared vision and commitment for building a first-class trail system. It is this type of public-private partnership that is moving Fort Dodge forward and making our community a special place. Randy Kuhlman chairs the Trails Advisory Board.